Zip Lock Baggies to Keep Flies Away! This Method Works! Who knew that you could use zip lock baggies to keep away flies? This really works and it’s so easy to set up! We went with our friends to a restaurant this past weekend and noticed zip lock baggies, filled with water pinned to the posts outside. The baggies had 4 pennies in each. We were so curious we had to ask what the baggies were for! The owner then told us that the baggies were to keep flies away! He said this method works extremely well! As we ate we noticed there were no flies around. There were a few that were outside the seating area but as soon as they landed, they flew off again! I was amazed! How this works you ask? The flies actually think it is another insect’s nest, feel threatened and decide to avoid that area! Fill plastic baggies half full with water. drop 4-5 pennies into each and zip them shut. Attach to posts with zip ties or tacks. That’s it! 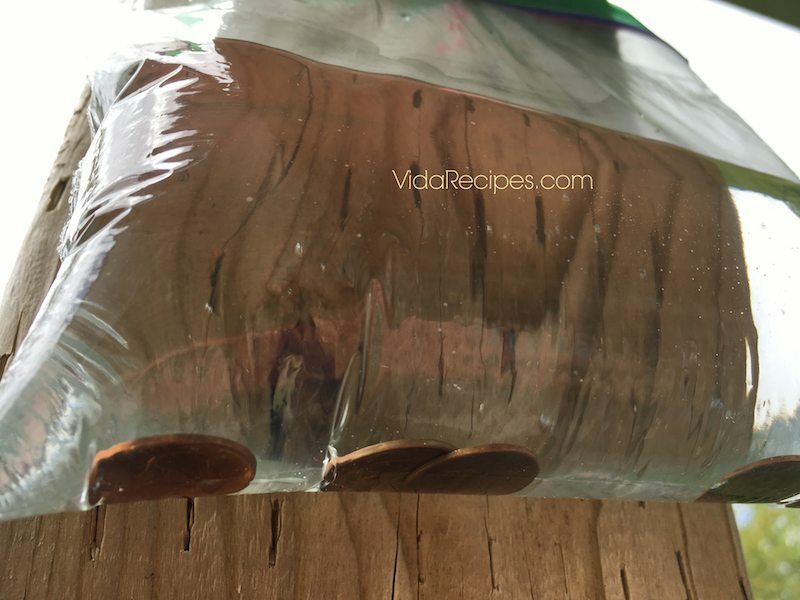 So easy to keep flies away using this method! Please note: I first posted this method years ago and people have been reporting excellent results ever since! This method really works! **I have also received several reviews saying this works WITHOUT the pennies as well so if you don’t have pennies you can still try this! My daughter started doing this a couple of years ago and it really works! Yes I do this and it works for moths at the porch and patio lights as well. I did this in the horse barn….It worked !!!! I went to a restaurant on Tybee Island once & they did the same thing. I have done this for years it always works ! It helps keep the flies away and its not toxic. Be sure to use shiny pennies. Any idea if this would also work for mosquitoes? It’s not useful if it doesn’t work on mosquitoes. Here in Minnesota in the summertime, the ‘skeeters are thirsty for human blood. The DNR have it pretty much under control these last 2 years. I am going to try it anyway and see if it works. Thanks for the tip! Copper has nothing to do with it. The ones I saw in NC only had water in them. Half full. When the fly that has multi faceted eyes lands near he sees thousands of MAGNIFIED eyes and flies away. Yes I have heard ‘just water’ works too! I guess I don’t understand what difference it makes if it is a copper penny or not if it’s zipped in a ziplock bag of water. How can that make a difference? It doesn’t matter and you can also do this without the pennies, it will still work. The bag should only be about half full so tack above the waterline and it won’t leak! Its not shiny pennies that work…its copper that works. So for USA penny you want 1978 and prior years (I think). These years have the copper that your looking for so that it will assist in driving off flys. It absolutely doesn’t! You don’t even need the pennies! Too Funny…it’s the light reflection that freaks them out. Copper just doesn’t degrade as quickly in water (stays shiny longer, doesn’t grow bacteria or algae) we’ve used dimes, aluminum foil balls, broken mirror pieces. They all reflect light and the water magnifies the effect with motion, even rainbows. Science baby.